The EDA Annual Summer Event took place on Thursday 7 July 2016 when 140 senior figures from the UK electrical industry boarded the Dixie Queen Paddle Steamer near Tower Bridge on the River Thames for a cruise downstream. The morning of networking on deck was followed by a pre-luncheon address from EDA President, Tom Jones with contributions from three manufacturers, Andy Will of Electrium, Mark Willmott of Eaton and Stuart MacKenzie of GDC. Following lunch, EDA Director, Margaret Fitzsimons, was unveiled the EDA’s ‘Engagement-o-metre’. This measurement index tool has been specially developed by the EDA to measure how engaged EDA members and affiliated manufacturers are in the Association’s activities. The metre goes from red – not engaged – through various stages of orange and yellow, to green for those members who participate in most of the activities of the Association. It was with great pleasure that Margaret announced that the most engaged manufacturer in the activities of the Association in 2015 was Marco Cable Management who took part in more EDA activities than any other manufacturer and emerged at the top of the ‘engagement-o-metre’ in dark green. In 2015, Marco were represented at all EDA Events and Forums and contributed to EDA’s publications. Margaret confirmed that Marco was two points ahead of its nearest rival on a scale of 1 to 10. 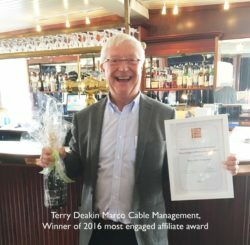 Terry Deakin (below) was awarded a framed certificate and a bottle of bubbly. The award for the most engaged wholesaler member went to Stearn Electric and was presented to a delighted David Schofield, MD of the company. In 2015, Stearn Electric partook in every EDA activity available to our members, putting them a steady two points ahead of other EDA members. Margaret went on to point out that while the ‘Engagement-o-metre’ seemed like a bit of fun today, the EDA takes member engagement very seriously and is determined to move everyone up that scale into the dark green zone and get them more involved in the Association. As has become tradition with this event, many of our guests went on to The Dickens Inn to continue enjoying the glorious weather and catching up with friends and colleagues.